As agricultural production increases to feed a growing world population, emphasis on sustainability and environmental protection have become increasingly important to not only crop production, but also optimum turf management and maintenance. To address these important issues, Fazio Championship Blend follows and promotes the 4Rs of Nutrient Stewardship. Implementation of this important concept helps to maximize fertilizer use efficiency by matching the needs of the turf plant and reducing nutrient loss from the soil. Right Source: Fazio Championship Blend fertilizer products are made using only the highest quality raw materials. The chemistry used in our production process allows for maximum nutrient uptake by offering the nutrients in their most available form. Right Rate: Because of the chemistry of Fazio Championship Blend fertilizer products, small amounts of fertilizer that the plants will readily use can be applied for specific applications (“Spoon-feeding”) which minimizes any negative effects of run-off or leaching into the environment. Right Time: Fazio Championship Blend fertilizers are designed to target specific growth stages of the turf plant. We create different products to address the ever changing nutritional needs of a growing plant throughout its life. Fazio Championship Blend fertilizers can provide the correct nutrient at the right time. Right Place: The correct placement of nutrients is paramount to an efficient fertilizer program. Fazio Championship Blend turf fertilizers are recommended specifically for foliar applications. 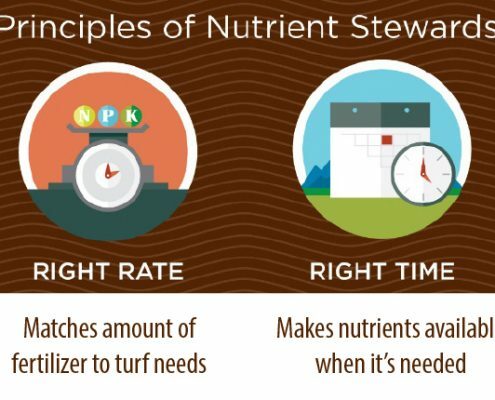 By placing nutrients where the plant can use them, we gain nutrient use efficiency. Using all of the 4Rs in conjunction is what allows Fazio Championship Blend to provide a solid foundation for any fertilizer program, whether it is one of our NPK products or our slow release nitrogen as a foliar application. The source of Fazio Championship Blend fertilizers allow for specific rates to be applied at specific growth stages and in a place that the turf grass can use them.